A few days ago, the solo tour dates for Shaggy 2 Dope and Violent J were announced. If you were in the Cleveland/Akron area, then you got the bone, as there wasn’t a show anywhere near the area; however, there is one show that seemingly got under the radar. 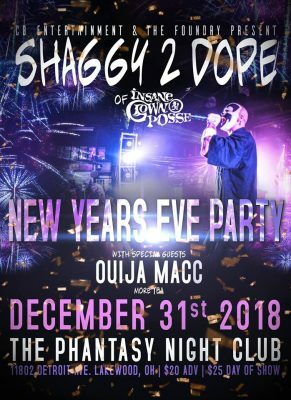 On New Year’s Eve, Shaggy 2 Dope and Ouija Macc will be in Lakewoood, Ohio (basically the outskirts of Cleveland, don’t get technical here). Zig Wap and A-LOW Rx will also be at the show. The venue is The Foundry and tickets are $20 advanced, $25 day of show. The only catch is that The Foundry is not a huge venue, the cap is roughly 300 or 400, so tickets may go fast. Shaggy 2 Dope will be embarking on his solo tour in which you can view the posting HERE. Yet again he is touring behind his last solo album F.T.F.O.M.F. Ouija Macc will be releasing his newest album Waterdamage and will be out a week before this show, with pre-orders being covered HERE. A-LOW Rx is releasing various music videos online ahead of time HERE but is also known as the frontman for the band Sterilizing the Deceased and this meme which garnered millions of views. Tickets can currently be purchased ahead of time HERE. More information, and other acts, will be released soon.